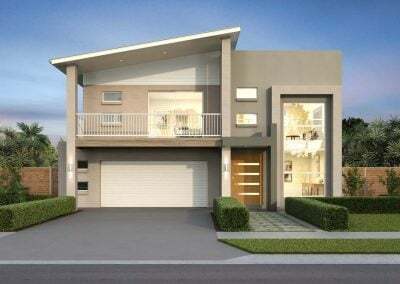 The Cove is a stunning modern design that incorporates everything you could want in a family home with some exciting design features. Downstairs is a large study with built in shelving, perfect for a home office or media room, a cook’s kitchen with huge walk in pantry, open plan dining, living and alfresco areas and a powder room. Indeed, everything you could want for you and your guests! Upstairs showcases a luxurious master suite with walk-in-robe and ensuite, as well as three further bedrooms that are cleverly positioned around a generous bathroom. There’s also a second lounge area upstairs that views into the study/media room below, creating a sense of luxury, space and style. For a modern family home with features designed to impress, look no further than the Cove.